On April 30, 1812, Louisiana became the 18th state in the United States. Louisiana was originally a French in 1731 but was relinquished to Spain after the French and Indian Wars. Louisiana was eventually returned back to France in about 1800. The famous French Emperor Napoleon Bonaparte sold Louisiana to the United States just two years later in 1803 in what was known as the Louisiana Purchase. 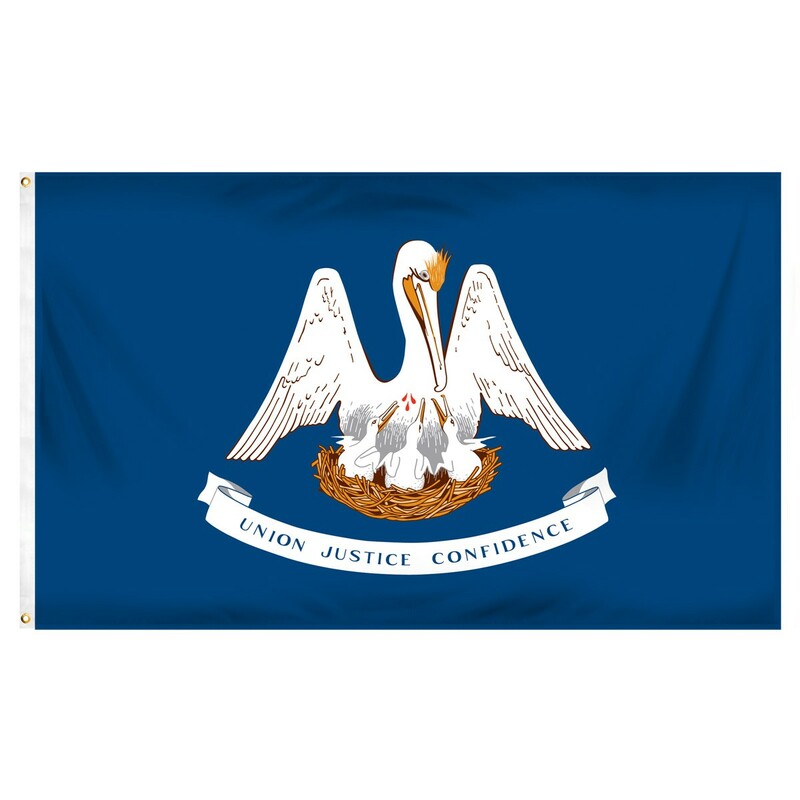 Louisiana did not adopt a state flag until 100 years after it became a state in 1912. The background of the flag is blue which represents truth and placed in the center of the flag is the state bird, The Eastern Brown Pelican, feeding her three young chicks inside a nest. There is a legend saying that the mother pelican is tearing flesh from herself at the chest to feed her own young. And underneath the birds is a ribbon stating the state’s motto, Union, Justice, and Confidence. Louisiana is home to New Orleans, famous for Mardi Gras, which is always celebrated 46 days before Easter. The city hosted its first Mardi Gras parade in 1837 and the floats did not start coming until twenty years later. The celebration generates a revenue of over $840 million annually thanks to tourists and regulars who come to celebrate. How Louisiana Got Named: Louisiana was named after Louis XIV of France. No Counties? Louisiana is one of two U.S. states that do not have counties. Instead, Louisiana is divided into 64 parishes. The only other state without counties is Alaska and they are divided by boroughs. Ohio is the seventeenth to become a state on March 1, 1803. Ohio was discovered by a French explorer and became British property after the French and Indian Wars. In 1783, the US obtained the land after the Revolutionary War. Ohio is one of the most industrious states, with major manufacturing plants located in or near major cities. Despite being the 34th biggest state in the US, Ohio is one of the the most populous states in the United States, placing in at the seventh most populous state as of 2013 with a population of 11,570,808 people. 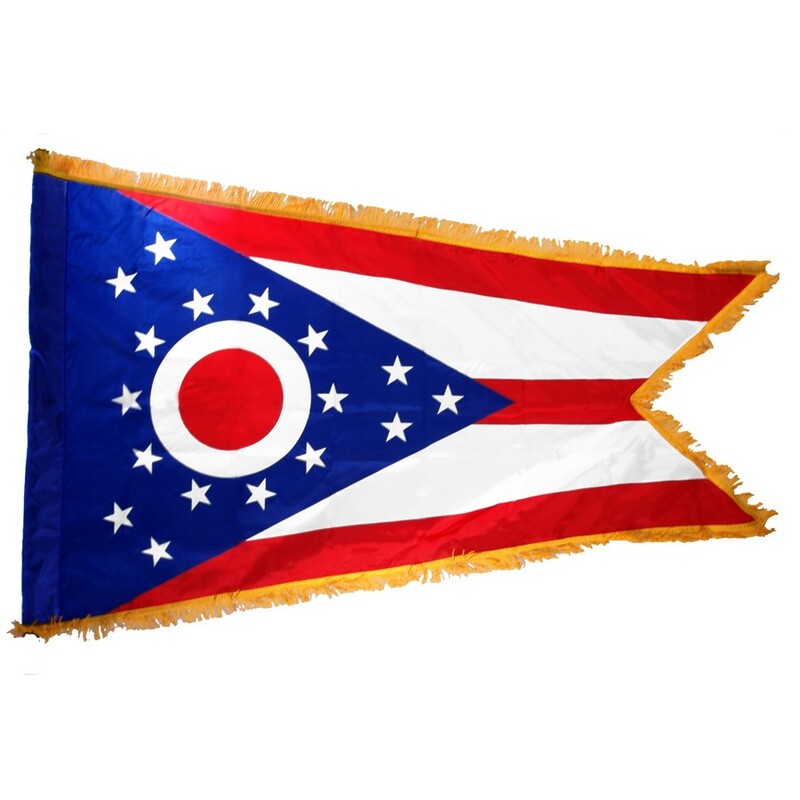 Ohio’s state flag is the only state flag in all of the 50 states to not be rectangular. Instead, the flag is a shallowtail design, which was designed by John Eisemann in 1901 and adopted one year later. This symbolic state flag features a large blue triangle with seventeen white stars in it to represent the other seventeen states in the Union. There are three red and two horizontal stripes outside of the blue triangle which symbolize the hills and valleys of Ohio. 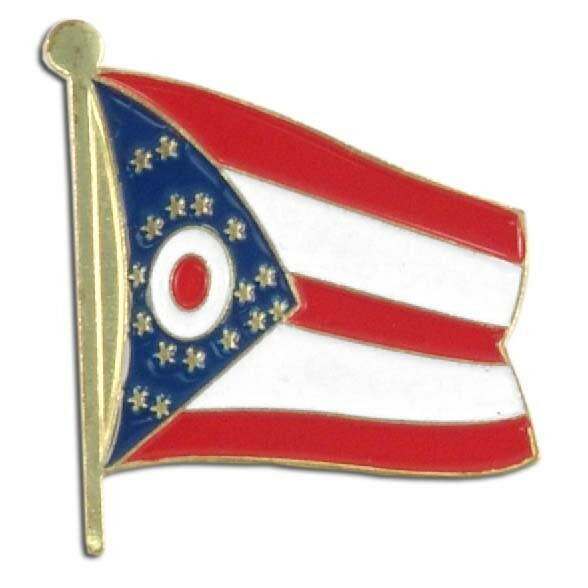 Inside of the blue starred triangle is a red circle outlined in white, representing the buckeye nut that is native to Ohio (the tree which is comes from, the Buckeye Tree, is also the official state tree). Ohio has been declared “the birthplace of aviation” due to the Wright Brothers, Wilb ur and Orville. While their first flight took place in North Carolina, the brothers were residents of the state. The state has several aviation museums, all of which are beneficial to the tourism of Ohio. The aviation industry also provides jobs for millions of Ohio residents. Many Ohio natives have become astronauts, including Neil Armstrong and John Glenn. Neil Armstrong was the first man to walk on the moon in 1969 and John Glenn, not only was he a senator for the state of Ohio, but he was also a U.S. Marine Corps aviator. While he was still a senator for Ohio, Glenn flew back into space on the Discovery Space Shuttle in 1998. More places to visit: The Rock and Roll Hall of Fame is located in Cleveland to view history about musical legends. Hopewell Culture National Historic Park located in Chillicothe is known for having earthworks in many geometric shapes and sizes. Approximately four years after Kentucky became a state, nearby Tennessee joined the US on June 1, 1796. Before it was a state, Tennessee had been discovered by a Spanish explorer. After being owned by France and Great Britain, it was eventually under the legislature of South Carolina. In 1790, Congress organized this territory, which allowed for Tennessee to join the union. 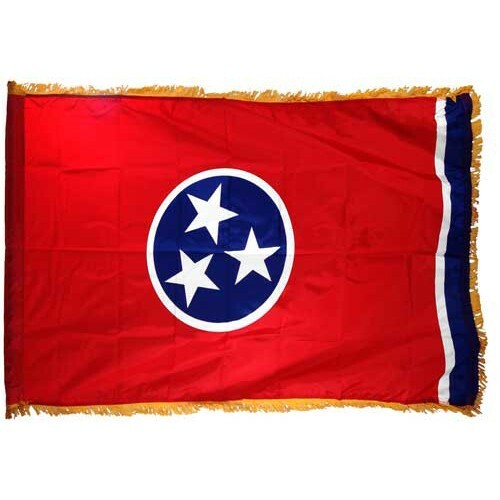 Tennessee’s state flag was adopted on April 17, 1905 and it was designed by LeRoy Reeves of the Third Regiment of the Tennessee Infantry. Placed in the center of a predominantly red background is a blue circle outlined with white along with white stars inside. These stars represent the three geographical regions of Tennessee: The great smoky mountains, the Highlands, and the Lowlands. To the right hand side is a blue bar and a smaller white stripe. Note that these colors are the same as the US Flag. The white represents purity, blue symbolizes the love the people of Tennessee feel for their state, and the red shows that in trying times, the people of Tennessee feel a strong love their state as true Americans. Tennessee has a large role in American music thanks to the popularization of bluegrass, rock and roll, country music. Not only is Nashville the state capital, but it is also known as Music City. The Grand Ole Opry was first broadcast in 1925, and continues to be the longest running live radio show (it runs every weekend). Tennessee is also home to Dollywood and Graceland, both famous by musicians. Graceland was once the home of singing legend Elvis Presley but is now a museum where millions visit every year, which Dollywood is a theme park owned by country singer Dolly Parton. Bordering states: Tied with Missouri, Tennessee is bordered by the most states, which are eight. The states are Kentucky, Virginia, North Carolina, Georgia, Alabama, Mississippi, Arkansas, and Missouri.